This is a classic entry point for rats. I've seen it a million times. Rats in the kitchen? There's a very good chance that they've chewed open a hole by the power supply behind the oven. I must have a dozen photos of this phenomenon. 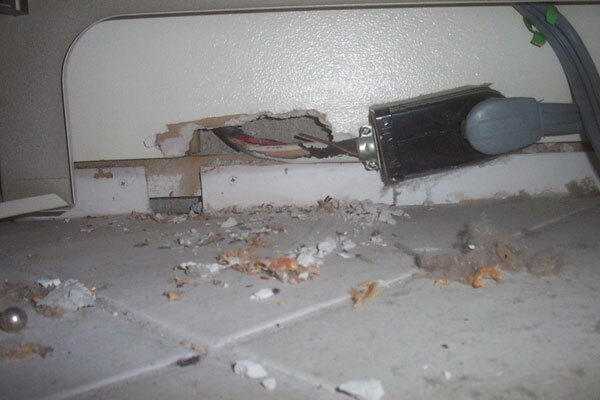 Rodents climb up and down the walls, and they love to use the electrical wire behind the stove. They find the area where the wire goes through the wall, and they chew it wide open. Once in your kitchen, they pilfer your food and gnaw on your stuff. They spread filth and disease. In order to get rid of them, not only must you trap and remove the rats, you must seal up their entry points! Look here. You can see that rats have chewed away the drywall behind the oven. Look at all that debris. Now they can simply climb down the wall from the attic, down the wire, and right into your kitchen. After I trap and remove all the rats, I seal up this entry point. 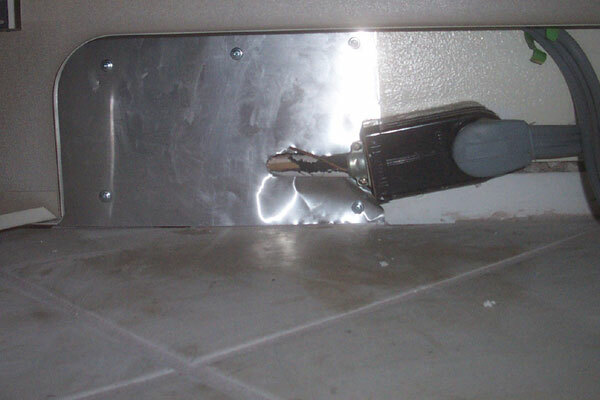 I use metal flashing, which rats can't chew, and bolt it into the wall. I also clean up the debris and decontaminate the area. You can't be too careful when it comes to filthy rats. Speaking of filthy, here's another danger of having rats enter behind the stove. They sometimes crawl up inside the stove and die of electrocution. This one rat in the kitchen really stinks up the house. 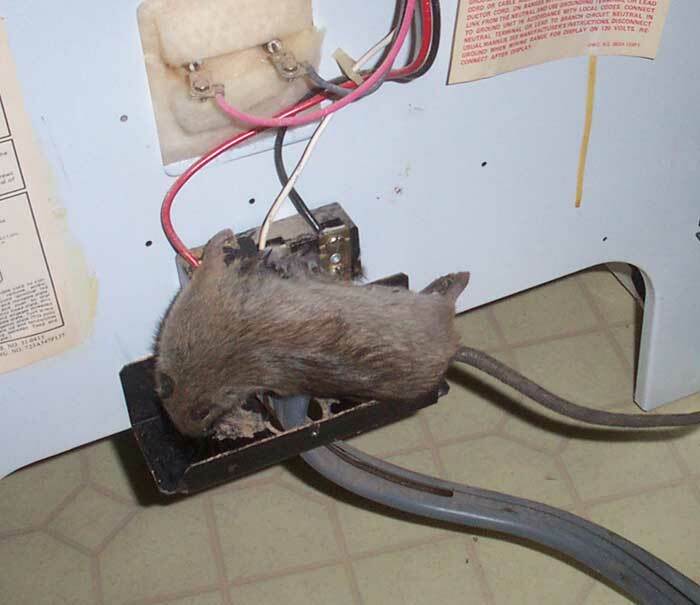 I have to remove the stove and the electrical panels and get that dead rat! Do you have rats or mice or rodents in your house? It's not a simple matter to get rid of them. Go ahead and stick poison under the stove and see what happens. Gasp! Now you say you have horrible dead rat stink in your walls and attic and yet new rats have simply replaced the old ones? Heaven forfend! Maybe you should have done it the right way - seal up 100% of the entry points so that no more rats can ever get into your house, and trap and remove, with TRAPS, NOT POISON, the remaining rats. Problem solved the right way. About a month ago, I saw what I thought was a large mouse run out of my kitchen into a dining room closet. A few days later, this very large mouse (which I have found out was not a mouse) lay dead on my kitchen floor, apparently the victim of my house cat, Petie. Not long after that, I started to smell an odd odor around my stove and last week discovered what turned out to be insulation sticking out from under the stove.
. When my plumber pulled the stove out, we discovered insulation and feces all over the floor under the stove and the wire was chewed. The stove has an opening in the back with insulation hanging out and, in addition, there is a vent on each side through which I can see droppings. Needless to say, the stove smells of what I assume is urine and feces. I immediately called an exterminator (last Friday) who knew from the size of the feces that we were not dealing with mice. He has put poison behind the stove and in my garage where we found a hole around the gas line leading up to the stove, as well as in my basement near an opening found under the stairs. I found one dead rat on Monday in my basement and have seen no evidence of them since. After reading your website, I realize that I probably called the wrong person and have a call into the local chapter of your company to see if they think that they should come out to make sure the problem is solved and to close up all possible entries. I was very interested to see the pictures you posted of the rat in the stove. From your experience, do you know whether they ruin a stove for good when they get into it? It is a gas range. The burners on the top have been working fine but the oven does not heat up. I would really appreciate any insight you can give to me before I call the GE repairman which I'm sure will cost me hundreds of dollars. Any advice or information from you would be greatly appreciated. For more rat trapping information, go back to the Orlando rat control page.